SUZI QUATRO - Between 1973 and 1980, Suzi Quatro featured in the British charts for no less than 101 weeks, and has sold to date over 55 million records, and still counting. Her hits include the No 1s “Can The Can”, that went on to sell two and a half million copies worldwide and “Devil Gate Drive”. Other hits include “48 Crash”, “Too Big”, “Daytona Demon”, “The Wild One”, “She’s In Love With You”, “If You Can’t Give Me Love”, and a million seller in the U.S.A., “Stumblin In” a duet with Chris Norman. From 77-79 Suzi spread her wings and landed a part on the worldwide hit TV Series “Happy Days”, playing Leather Tuscadero opposite Henry Winkler and Ron Howard. She continued to act in other shows including, “Minder”, “Dempsey and Makepeace”, and more up to date, “Absolutely Fabulous” and “Midsomer Murders”. She has had her own Radio Two show and has also made special documentaries for the station that include Elvis Presley, Otis Redding, Janis Joplin, Jim Morrison and Patsy Cline. “Silver Dream Racer”, “That’ll Be The Day” and “Stardust”, as well as appearing in “Eastenders” as Eddie Moon. LES McKEOWN’S BAY CITY ROLLERS -The band shot to superstardom with "Keep On Dancing", the Bay City Rollers' first single, quickly followed by "Remember: Sha La La La”, “Shang-A-Lang”, "Summerlove Sensation" and "All Of Me Loves All Of You" all hitting the Top Five. "Bye Bye Baby", released in 1975, was their first UK Number 1, which was followed by "Give A Little Love”, just few months after. Other hits include “Love Me Like I Love You”, “Money Honey” and “I Only Want To Be With You”. "Rollin'" was their debut album and reached the number 1 position the first of many chart toppers! Between 1975 - 1978, they toured all over the world and played to sold out crowds in the USA, Japan, Great Britain, Europe, New Zealand and Australia. The demand to hear the Bay City Rollers with Les McKeown is still enormous! SMOKIE - To be rock 'n' roll survivors is an achievement. To be Europe's top live band, 45 years after its inception is truly fantastic. The band scored their first top 3 with “If You Think You Know How To Love Me” which went onto sell millions around the world. Other singles include “Don't Play Your Rock 'n' Roll To Me”, “Living Next Door To Alice”, “Oh Carol”, “Needles & Pins”, “It’s Your Life” and “For A Few Dollars More”. “Living Next Door To Alice (Who the F**K is Alice)” featuring Roy Chubby Brown brought yet another new dimension into the band's history. First a hit for Smokie in 1976 and reaching number 5 in the charts it is somewhat ironic that since its re-release in 1995, it again reached the top 5 selling in excess of 200,000 copies. 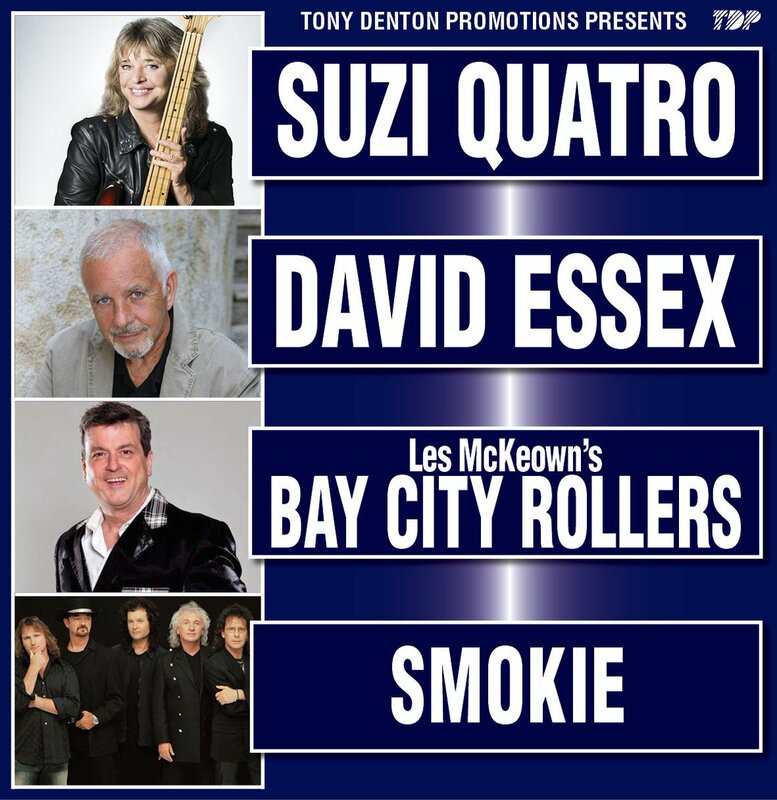 PLEASE NOTE - Smokie will not appear in Manchester, Leeds, Cardiff & Brighton, these will feature Showaddywaddy instead.